The vascular factor in Alzheimer’s disease (AD), affecting its development and progre-ssion, is one of the most urgent problems of modern neuroangiology. The research investigates the characteristics of cerebral angioarchitectonics identified at different stages of AD. The research included 106 patients: 1) The Test Group—47 patients suffering from various stages of AD; 2) The Control Group—59 patients suffering from the most common lesions of the brain accompanied by neurodegenerative changes, the development of dementia and cognitive impairment, but not having AD. All the patients underwent: the testing of cognitive functions (MMSE), the determination of severity of dementia (CDR) and AD stages (TDR), computed tomography (CT), magnetic resonance imaging (MRI), scintigraphy of the brain (SG), rheoencephalography (REG), and cerebral multi-gated angiography (MUGA). Patients with AD different stages showed the following changes in angioarchitectonics and microcirculation: Absence of pronounced atherosclerotic lesions of intracranial vessels, reduction of the capillary bed in the temporal and temporo-parietal regions, development of multiple arteriovenous shunts in the same areas, early venous discharge, abnormal expansion of venous trunks that receive blood from arteriovenous shunts, venous congestion at the border of the frontal and parietal region, increased looping of intracranial arteries. Control Group patients had no combination of the abovementioned changes. These vascular changes are specific for AD and are in fact the vascular factor of this disease; they may also be called dyscirculatory angiopathy of Alzheimer’s type (DAAT). Patients suffering from other diseases that are accompanied by neurodegenerative changes in the brain, dementia and cognitive impairment do not have them. According to the Alzheimer’s Association, Alzheimer’s disease (AD) is becoming a global problem of modern mankind. The number of patients suffering from this disease is increasing every year worldwide. In the United States there were 5.4 million patients in 2011  and it is estimated that by 2050 the number of cases will increase to 13.5 million people , and in case of diagnosis and detection of preclinical stages of the disease this figure can considerably rise. In 2010, there were 35.6 million of identified cases worldwide, and by 2050 this figure is expected to increase to 115.4 million while every other inhabitant of the planet at the age of 85 and older will get sick [1,3]. Active AD research began during the 1980s . The introduction of CT and MRI contributed to successfully study the lifetime neurodegenerative changes that occur in the brain tissue during the development of the disease [5-7]. The use of PET and biomarkers has allowed visualizing the accumulation of amiloid-beta and tau [8-12]; however, despite the extreme perspectiveness of these studies, no standardized research methodology has been developed yet. Moreover, several authors note that in some cases high levels of these proteins are observed in practically healthy individuals not suffering from AD [11,12]. Despite the fact that the first reports of vascular changes in the brain identified in AD were made by F. Morel as far back as in the 1930s , it was for a long time believed that vascular lesions of the brain were the cause of vascular dementia and that they had no relation to the etiology of AD . Consequently, the vascular factor in AD was given insufficient attention. Only in recent years, the accumulation of material has promoted a research interest to this important problem [13,15-20]. The research was often conducted on experimental models of the disease or carried out by circumstantial evidence when examining patients or based on the results of postmortem autopsies of patients with advanced AD [13,15,20]. Lifetime angiographic studies among patients with different stages of AD have almost never been carried out. Insufficiently researched has been the correlation of vascular and degenerative changes that develop in the brain tissue with the progression of AD and their joint effect on dementia and cognitive impairment [19,21,22]. The research investigates the characteristics of cerebral angioarchitectonics and defines the vascular factor in AD revealed at different stages of the disease. The whole research has been carried out with the approval of the Ethics Committee, as well as with the consent of the examined patients and their relatives. • To perform a complete differential diagnosis of all the examined patients was not the objective of this research. 106 patients aged from 28 to 79 (average age 67.5) have been examined, of whom 53 (50.00%) were male patients and 53 (50.00%) were female patients. 1) Cognitive function was assessed by the Mini-Mental State Examination (MMSE) . 2) Dementia severity was clinically determined by the Clinical Dementia Rating scale (CDR) . 3) AD stages were tomographically determined among Test Group patients by the Tomography Dementia Rating scale (TDR)  during CT and MRI examination. 4) Laboratory examination was performed according to generally accepted interventional cardiology schemes and included clinical, biochemical and coagulological examination. 5) Scintigraphy of the brain (SG) was carried out on a gamma camera (Ohio Nuclear, US) following the classical method in dynamic and static modes using TC 99 M pertechnetate 555. 6) Rheoencephalography (REG) was performed using “Reospektr-8” (Neurosoft, Russia) in accordance with the standard automated method determining pulse volume abnormalities in the hemispheres of the brain. 7) CT and MRI of the brain were performed on “Somatom” (Siemens), “Hi Speed” (GE), “Tomoscan” (Philips), “Apetro Eterna” (Hitachi) determining the volume of the temporal lobes of the brain followed by detection of the degree of atrophy as a percentage of total tissue weight [19,21,22]. 8) Cerebral multi-gated angiography (MUGA) was performed on “Advantx” (GE) following the classical method of transfemoral access. Simultaneously, taking into account the start and the speed of the injection, 10 - 12 ml of Omnipack 350 was introduced intra-carotidally and 7 - 8 ml intra-vertebrally. Registration was carried out in direct and side projections in constant subtraction mode at a speed of 25 frames per second. Further on the angiograms obtained in each phase of contrast were analysed frame by frame [19,22]. Analysis of capillary density was performed in the appropriate phase with an automatic method by means of the computer program “Angio Vision” based on determining the degree of blackening of the corresponding image section [22,26]. • Late AD stage—TDR-3: a group with sufficiently severe dementia, gross cognitive impairment, had previously been diagnosed with AD, history of the disease ranged from 7 to 12 years, atrophy of the temporal lobes was 33% - 62%, which corresponds to CDR-3 (MMSE score 7 - 11 points)—8 (17.02%) patients. The control group: 59 (55.66%) patients aged 28 to 78 (average age 68), 36 (61.02%) male patients and 23 (38.98%) female patients. Patients in this group either had different types of brain lesions accompanied by neurodegenerative changes, dementia symptoms and cognitive impairment but did not have AD, or had involutive changes of the brain but did not have any specific complaints, considered themselves healthy, and treated existing cerebral disorders as age-appropriate and normal. • The group with Parkinson’s disease and manifestations of dementia—4 (6.78%) patients, CDR-1 being observed in 1 case, CDR-2—in 3 cases. CT and MRI among Control Group patients revealed certain morphological changes in the brain which can be attributed to general cerebral changes; however, no specific atrophic changes in the tissue of the temporal lobes of the brain characteristic for AD have been identified in any case. • Increased looping of distal intracranial arterial branches—37 (78.72%) patients (Figure 5). No combination of such vascular disorders has been identified among any of Control Group patients indicating that it is specific for AD. • Disseminated early venous dumping was detected in 28 (53.85%) cases. None of Test Group patients had similar disorders. During SG, there was a slowing of blood flow in the cerebral hemispheres to Tmax 9 - 13 sec, T1/2 10 - 20 sec observed among all patients of the test and control groups regardless of the diseases they had. During REG, there was a 15% - 50% decrease in the volume of pulse blood supply in the carotid basins observed among all patients of the test and control groups regardless of the diseases they had. Table 1. Vascular disorders of the brain identified among patients of the test and control groups during MUGA. Absence of atherosclerotic changes of intracranial vessels. 1: Reduction of capillary bed in the temporal brain regions; 2: Reduction of capillary bed in the fronto-parietal brain regions. Figure 1. 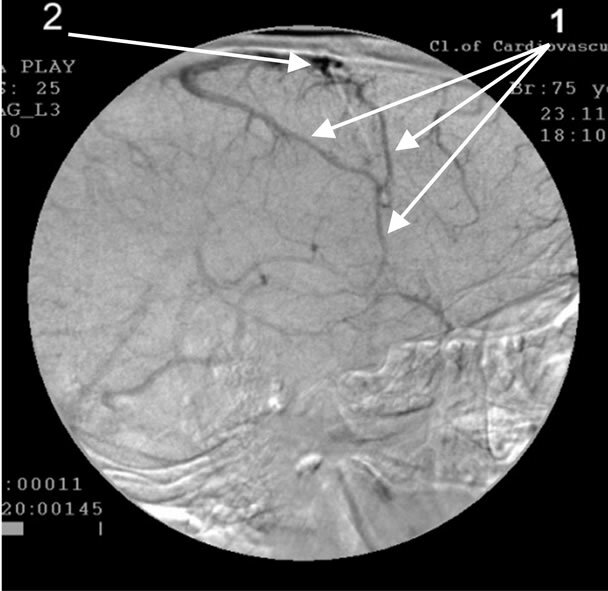 Angiogram of the right internal carotid artery of patient A., 56 years old (lateral projection capillary phase), 2-year anamnesis of the disease, TDR-1. Absence of atherosclerotic changes of intracranial vessels. 1: The development of multiple arterio-venous shunts in the fronto-parietal and temporal brain regions. Figure 2. 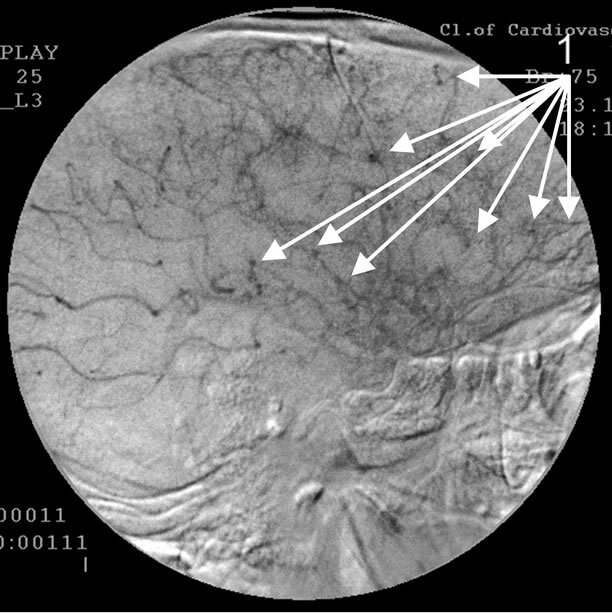 Angiogram of the left internal carotid artery of patient P., 75 years old (lateral projection capillary phase), 12- year anamnesis of the disease, TDR-3. Absence of atherosclerotic changes of intracranial vessels. The development of early venous discharge in the temporal and fronto-parietal region. Simultaneous filling of arteries (1) and veins (2). Figure 3. 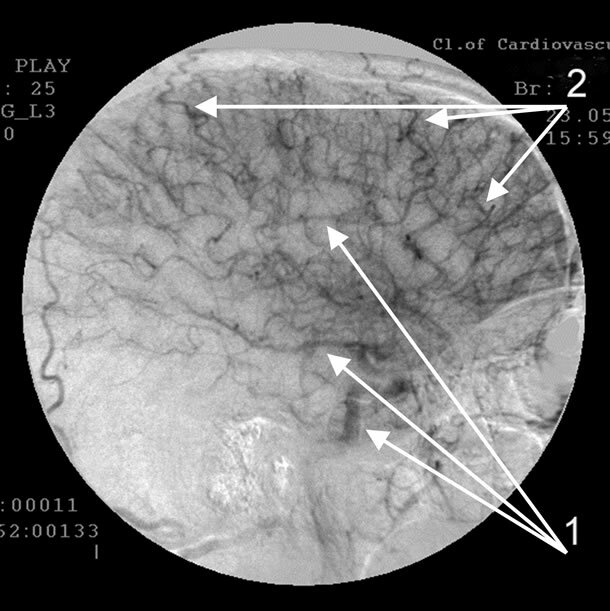 Angiogram of the left internal carotid artery of patient O., 72 years old (lateral projection capillary phase), 9-year anamnesis of the disease, TDR-2. Absence of atherosclerotic changes of intracranial vessels. 1: The development of pathologically enlarged veins that receive blood from arterio-venous shunts in the temporal and fronto-parietal region; 2: Blood stagnation on the border of the fronto-parietal region. Figure 4. Angiogram of the left internal carotid artery of patient P., 75 years old (lateral projection venous phase), 12 year anamnesis of the disease, TDR-3. Absence of atherosclerotic changes of intracranial vessels. 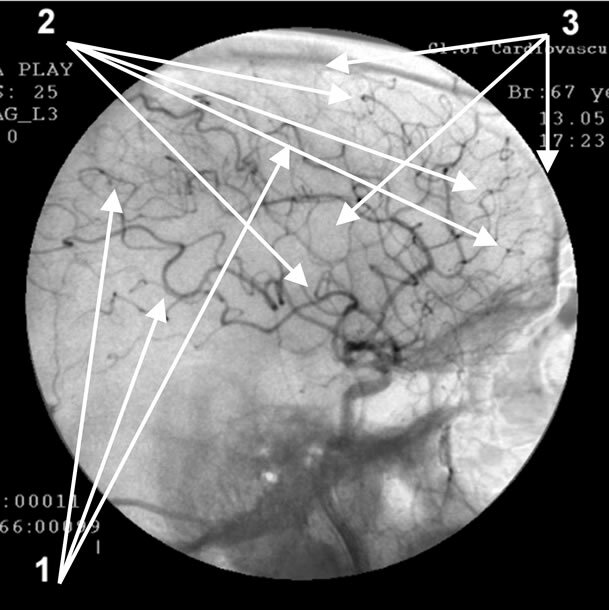 1: Multiple loop formation; 2: Multiple arteriovenous shunts in fronto-parietal and temporal regions; 3: Development of hypovascular region. Figure 5. 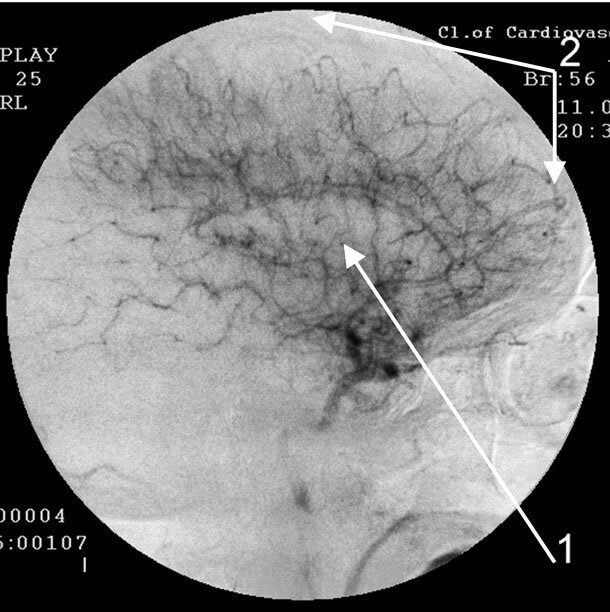 Angiogram of the left internal carotid artery of patient S., 67 years old (lateral projection early arterial phase), 12-year anamnesis of the disease, TDR-3. Since Control Group patients did not have the specific blood supply and microcirculation disorders in the temporal and fronto-parietal brain regions identified among Test Group patients, we can conclude that these disorders are specific for AD and are not specific for other diseases associated with the development of neurodegenerative changes in the brain burdened by the development of dementia and cognitive disorders. It suggests that these vascular changes are the vascular factor in AD [15-17, 20,28,29]. We have also called these changes the “dyscirculatory angiopathy of Alzheimer’s type” (DAAT) [18, 19,27]. The severity of these disorders does not depend on how fast AD symptoms develop or how severe dementia is, they are almost equally observed among patients with pre-clinical (TDR-0) and clinical (TDR-1, TDR-2, TDR- 3) stages of the disease and are not only the vascular factor but also the vascular symptom of AD . The essence of the vascular factor in AD [18,19,26] is the reduction of the capillary bed in the temporal and fronto-parietal regions of the brain which in turn leads to the formation of multiple arteriovenous shunts in these areas. The developed arteriovenous shunts lead to early arteriovenous blood dumping resulting in the development of abnormally enlarged venous trunks that receive blood from the temporal and fronto-parietal region, which in turn leads to venous congestion at the border of the frontal and parietal lobes [18,27]. Disorders of microcirculation in the brain identified among patients suffering from AD are described by many authors [16,17,30]. However, the vascular factor includes not only capillary but also distal arterial and venous disorders. Obviously, these changes lead to a breach in hemodynamics and cause specific hypoxia in these areas, which in turn may contribute to slower excretion and increased accumulation of amyloid-beta in the walls of blood vessels, paravasal tissue and the tissue of the temporal and fronto-parietal brain regions, which in turn contribute to AD development and progress . These data are confirmed by other authors  showing that AD development in the brain tissue is accompanied by the accumulation of vasculotoxic and neurotoxic molecules causing a decrease in cerebral blood flow and hypoxia which in turn lead to the development of dysfunction and neurodegenerative changes. It cannot be said with absolute certainty that vascular disorders are directly related to the early deposition of amyloid-beta in the capillary and arterial wall or paravasal tissue . Moreover, it is unlikely that such accumulation of amyloid-beta occurs well before the onset of symptoms. It should be noted that there are studies showing that vascular changes in the temporal lobes of the brain are detected even among AD patients’ children and grandchildren . As a result, the question of what comes first arises: is it the vascular factor manifested in congenital or acquired disorders of blood flow and microcirculation of the brain that promotes the development of AD  or is it the disease itself that causes similar changes in distal arterial, microcirculatory and venous bed [26,29]. This question has recently been the issue of concern to many authors, but no definite answer has been found yet . The severity of the disease, the severity of dementia and cognitive impairment, the state of higher mental functions are frequently directly dependent on the severity of atrophic changes in the brain tissue [19,35-38]. Thus, patients with pre-clinical TDR-0 stage have 4-8% atrophy of the temporal lobes, but patients with advanced TDR-3 AD stage have 33% - 62% atrophy [19,21,22,27], though vascular disorders occurring in the brain during the development of AD are at about the same level among all patients regardless of their TDR group [21,27]. The combination of these structural and vascular disorders is specific for the development of AD and is not found among patients suffering from other neurodegenerative diseases of the brain accompanied by the development of dementia and cognitive impairment [18,27]. The significance of vascular disorders is confirmed by other authors [16,38-40]. • Large looping of distal branches of intracranial arteries. These changes can be traced among patients with both advanced and preclinical stages of the disease and are not only the vascular factor but also the vascular symptoms of AD. At the same time, AD patients have either none or poorly expressed atherosclerotic changes of intracranial vessels. The vascular factor in AD is of great importance as it is necessary to develop a new effective treatment for this disease. Di Carlo, A., Baldereschi, M., Amaducci, L., et al. (2002) Incidence of dementia, Alzheimer’s disease, and vascular dementia in Italy. The ILSA study. Journal of the American Geriatrics Society, 50, 41-48. http://www.ncbi.nlm.nih.gov/pubmed?term=Di%20Carlo%2C%20A.%20Baldereschi%2C%20M.%20Amaducci%2C%20L.%20et%20all.%20(2002).%20Incidence%20of%20dementia%2C%20Alzheimer's%20disease%2C%20and%20vascular%20dementia%20in%20Italy.%20The%20ILSA%20Study. Skoog, I., Kalaria, R.N. and Breteler, M.M. (1999) Vascular factors and Alzheimer disease. Alzheimer Disease and Associated Disorders, 13, 106-114. http://www.ncbi.nlm.nih.gov/pubmed?term=Skoog%20I%2C%20Kalaria%20R%20N%2C%20Breteler%20M.M.